An automotive fuse is an electrical component that is designed to protect other components, devices, and wiring from any damage that might occur due to excess current flow. When a circuit fails or is abnormal, the current is constantly rising, and the increased current may damage some important devices or valuable devices in the circuit, and may also burn the circuit or even cause a fire. If the fuse holder fuse holder is correctly placed in the circuit, the fuse will blow itself when the current abnormally rises to a certain height and a certain degree, and a dangerous situation such as a fire may occur. At this time, the fuse holder acts to isolate from the outside world, thereby protecting the circuit from safe operation. Installation: Cut this looped wire about in the middle first, one of the ends connect to your power source, the other to the accessory power wire that you are attempting to power. Loop Length: 12 inches / 30cm. For Standard/Regular Blade Fuse(ATO); dimension: 19.1 × 18.5 × 5.1 mm. Fit Fuse: ATC/ATO blade fuse of 1A, 2A, 3A, 4A, 5A, 7.5A, 10A, 15A, 20A, 30A. It features a water resistant cap and a loop 14-gauge insulated wire. Heavy Duty 14 AWG Fuse Holders, Protecting circuits and electrical equipment. Easy to add additional circuits for cars, CD players, fax machines and etc. PREMIUM QUALITY: Fuse holders wiring harness select Tin plated copper as conductor to ensure its good bending performance, melting resistance and excellent electrical conductivity. Waterproof cap of fuse holder: Unique design of dual slot tight-fitting waterproof lid to enhance moisture-proof, waterproof performance and dust proof. 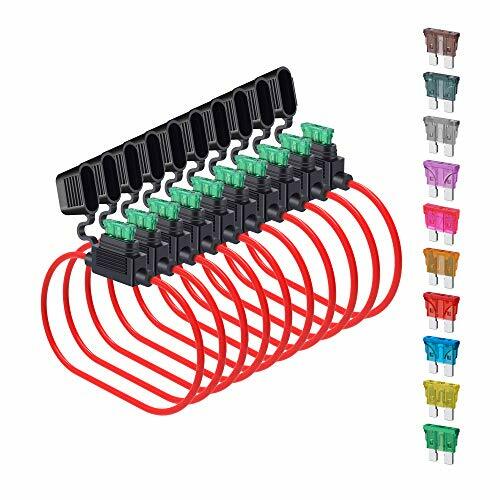 Package included: 10 pack inline fuse holder + 50pcs car fuses sets ( 1A / 2A / 3A / 4A / 5A / 7.5A / 10A / 15A / 20A / 30A ) 5pcs each. If you have any questions about this product by SIM&NAT, contact us by completing and submitting the form below. If you are looking for a specif part number, please include it with your message.